The news items above point to one of the Clean Power Plan’s (CPP) fatal legal flaws. The CPP requires states to adopt CO2 performance standards for existing fossil fuel power plants. As such, the CPP is unlawful if its legal prerequisite — EPA’s proposed CO2 performance standards for new power plants, the so-called Carbon Pollution Standards (CPS) rule — is unlawful. The CPS rule proposes a performance standard of 1,100 lbs. CO2/MWh for new coal power plants. Coal power plants can meet the standard only by installing carbon capture and storage (CCS) technology. Under §111(a) of the Clean Air Act (CAA), performance standards are to reflect the “best system of emission reduction” (BSER) that has been “adequately demonstrated,” taking “cost” into account. EPA claims CCS is the adequately demonstrated BSER for new coal power plants. Applesauce! CAA §111(a) requires that performance standards be “achievable.” The D.C. Circuit Court of Appeals interprets the term to mean achievable for the industry as a whole (National Lime Association v. EPA, 627 F. 2d 416 at 443). However, as Bloomberg points out, the Boundary Dam Power Station is the world’s only utility-scale CCS power plant in commercial operation, and the “economics only work” because of two favorable circumstances atypical for the industry as a whole: a generous subsidy and proximity to an enhanced oil recovery (EOR) operation. With the federal deficit still near half-a-trillion dollars, Congress is not about to pony up lavish subsidies for CCS power plants, especially when natural gas combined cycle (NGCC) power plants easily meet a more stringent CO2 emission performance standard (79 FR 1486) at much less cost (EIA, Table 1, p. 6). EPA identifies only 12 states with significant EOR operations (79 FR 1474). Coal power plants not located near oil fields would not have a market for their captured CO2. Thus, on two separate counts, the proposed standard is not achievable. CCS combined with EOR is not BSER for an even more fundamental reason, first noted by my colleague William Yeatman. On a lifecycle basis, CCS + EOR produces more CO2 emissions than a conventional coal power plant. Without EOR, CCS is too costly to qualify as “adequately demonstrated.” But with EOR, CCS cannot be a “best” system of emission reduction because it increases rather than reduces emissions. EPA does not perform a life-cycle analysis to net out the CO2 injected underground to increase oil production against the additional CO2 emitted when the recovered oil is combusted. Fortunately, a DOE National Energy Technology Laboratory (NETL) analysis allows us to make a ballpark estimate. Nearly 20 billion metric tons of CO2 will need to be purchased by CO2-EOR operators to recover the 67 billion barrels of economically recoverable oil. Of this, about 2 billion metric tons would be from natural sources and currently operating natural gas processing plants. The remainder of the CO2 demand (18 billion metric tons) would need to be provided by anthropogenic CO2 captured from coal-fired power plants and other industrial sources. According to EPA, combusting one barrel of oil emits, on average, 0.43 metric tons of CO2. Combining that conversion factor with NETL’s analysis, we get the following results. Injecting 20 billion metric tons of CO2 underground in EOR operations produces 67 billion barrels of oil that, when combusted, emit 28.81 billion metric tons of CO2. Even assuming no leakage from fugitive emissions, EOR produces 1.41 tons of CO2 emissions for every ton injected underground. EPA may not lawfully base CO2 performance standards for new coal power plants on CCS. Until and unless EPA promulgates valid CO2 performance standards for new power plants, it may not promulgate CO2 performance standards for existing power plants. The requisite legal trigger for the CPP does not exist; the rule is unlawful. The implications for U.S. climate policy are hard to overstate. The CPP is the centerpiece of President Obama’s Climate Action Plan. It is both EPA’s most aggressive greenhouse gas regulatory program to date and the core of the U.S. emission-reduction pledge in the current round of climate treaty negotiations. The President hopes in 2015 to conclude an international climate agreement that takes effect in 2020 without Senate ratification. Supposedly, bypassing the Senate is kosher because, unlike the expired Kyoto treaty, the new compact would only be of “legal force” rather than “legally-binding.” Whether that is a valid distinction or legalistic gobbledygook remains to be determined. Regardless, due to the CPP’s multiple serious legal defects, U.S. negotiators are bargaining with chips they don’t have. When other countries figure out Obama is making promises he can’t keep, the last desperate attempt to negotiate an ambitious Kyoto successor treaty could spectacularly fail. Industry is gearing up to challenge the power plant rules in court, as are many states, and the House and Senate will almost certainly pass Congressional Review Act resolutions of disapproval to overturn the regulations. Obama will almost certainly veto those measures, of course, but there is no way his party will be able to avoid debate about climate policy in 2016, as it did in 2012. 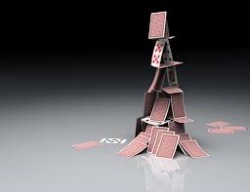 In short, the climate policy milestones the President hopes to achieve in 2015 look increasingly like a greenhouse of cards. Happy New Year!